Interest Rate Cuts Are On The Agenda, But Will They Help? 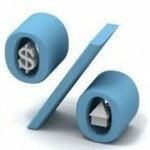 More interest rate cuts look to be on the agenda, but will they be effective? 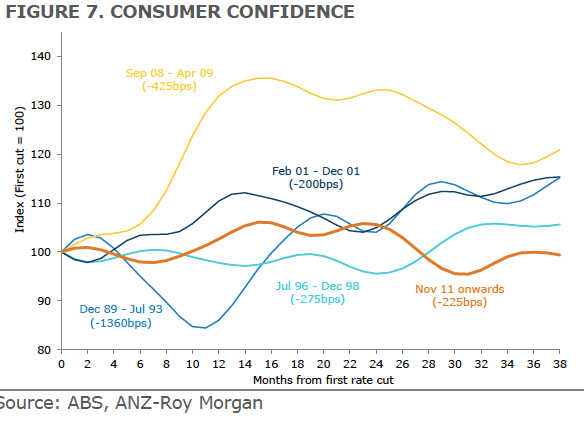 To answer this question ANZ Bank compared this easing cycle to the previous four interest rate cycles and found that rate cuts are working, although the response has been more subdued than previously. They conclude that further rate cuts will be effective in giving the economy a second wind. They back this conclusion with some interesting graphs as they dissect the economy and our housing markets. 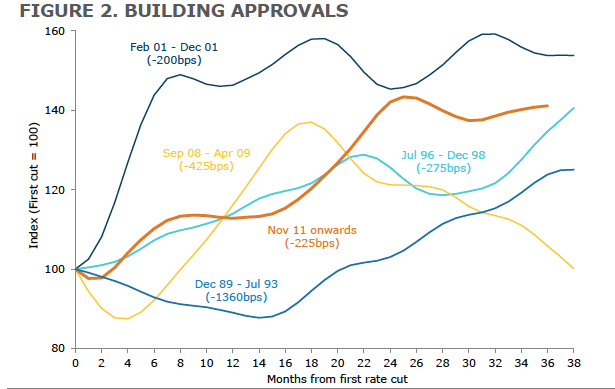 Following an 18 month period of unchanged rates, further rate cuts now look to be almost imminent. A lower inflation outlook looks set to give the RBA scope to cut rates and further support demand. But will further rate cuts help? This article looks at how the key cyclical indicators have performed in this easing cycle compared to the previous four easing cycles. 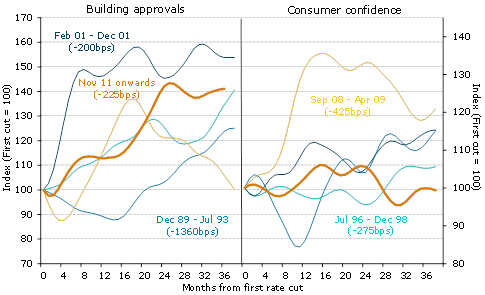 We find that rate cuts are working, but they are not boosting activity to the same extent as previously. The response to lower rates has varied across sectors. The impact in the housing sector has been on the whole strong, relative to past cycles. Where this cycle has disappointed is the broadening of asset price inflation into stronger household consumption and business investment. The response from consumer confidence, household spending and employment has been particularly lacklustre compared to previous cycles. [sam id=52 codes=’true’]We expect that the broadening of growth is being impeded by structural constraints that are offsetting the cyclical impetus to the economy. These structural factors include slow household credit growth, the falling terms of trade, and the unwind of the mining investment boom. The lack of ‘animal spirits’ is another important factor in the muted response to rate cuts in the current cycle. 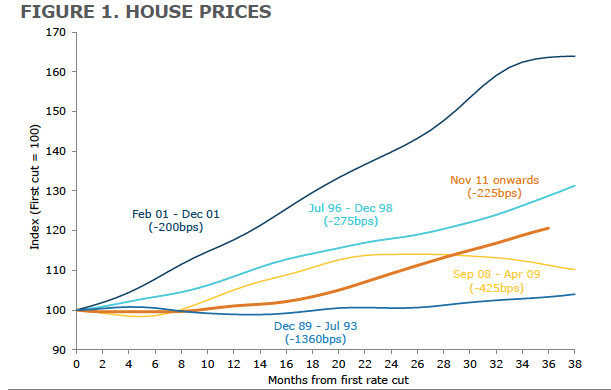 Given the evidence that easy monetary policy is working, we expect additional rate cuts will be effective. Further monetary policy easing is needed to provide some fresh stimulus to help offset some of the structural factors weighing on growth. 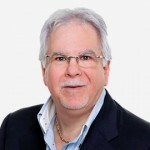 Confidence, both business and consumer, will remain key to the recovery, but additional monetary easing has the potential to stimulate demand and allow the recovery in the non-mining economy to gain further traction. The response from the overall housing sector has been very positive, especially compared with other sectors, but also compared with history. While house prices were comparatively slow to respond in this easing cycle, growth is now middle of the range compared to previous cycles. Residential construction has been the standout sector in this easing cycle, with building approvals hitting a record high in November. This building cycle has also been particularly strong relative to history. Indeed, it has only been surpassed by the 2001 cycle, when building approvals rebounded off the record lows seen post the introduction of the GST. 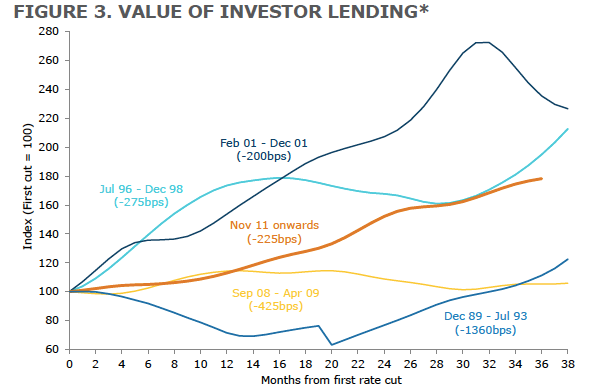 Investor housing lending is up almost 80% in this easing cycle. Although this is solid growth, it is not as strong as was the case in the late 1990s and early 2000s easing cycles, when the credit boom was in full swing. As a proportion of total housing finance, however, investor lending reached a new record high of over 50% in October. Although investor credit growth has eased modestly in recent months, previous easing cycles suggest a late cycle surge is possible. 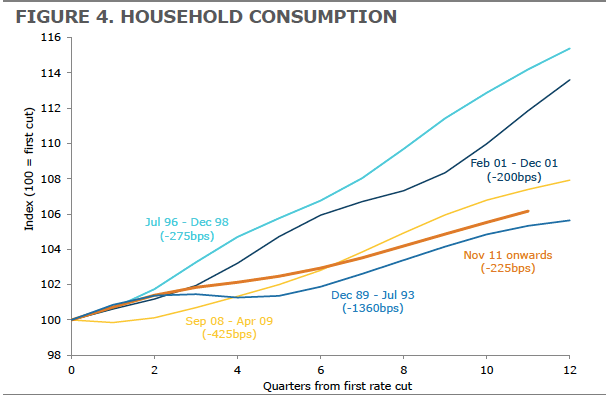 Consumption has under performed all the previous cycles with the exception of the early 1990s, when the economy was in recession and unemployment reached over 11%. The main reason for this has been soft income growth, which looks set to continue to constrain consumption growth. The decline in the household saving rate is providing some offset. 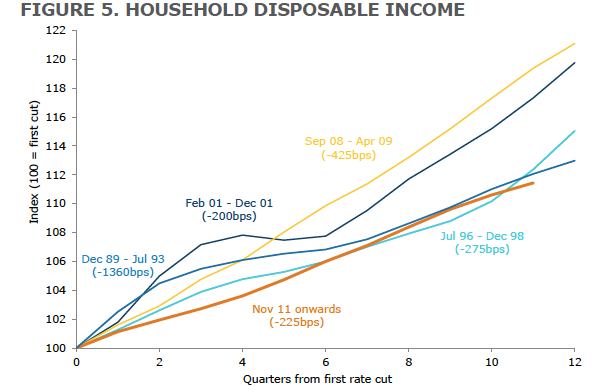 Household disposable income growth in this cycle has under performed all of the previous four cycles. This primarily reflects ongoing soft wages and employment growth amid continued focus on cost reduction by both the public and private sectors. Wages growth is unlikely to improve anytime soon. Combined with a soft employment outlook and higher effective tax rates (reflecting bracket creep), disposable income growth is likely to remain subdued. Further rate cuts, however, would provide some boost to disposable income. 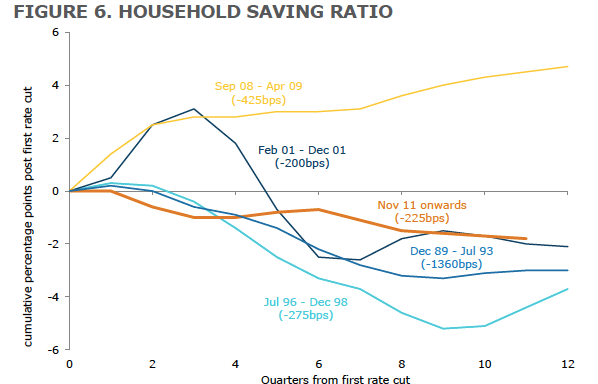 While the household saving rate has fallen moderately in this cycle, the level of the saving rate remains high relative to past cycles (with the exception of 2008-09). Rising asset prices have supported the decline in the saving rate in this cycle but it appears the wealth effect is weaker post the GFC, due to a reduced credit tailwind. In addition, surveys suggest consumers became more risk averse in H2 2014, which may have prevented a further fall in the saving rate. Animal spirits have been lacking in the consumer sector; consumer confidence saw the smallest increase in this cycle relative to previous cycles. After short-lived bounces in late 2012 and 2013 (reflecting house price gains and optimism surrounding the new government) confidence has been much weaker in 2014. This reflects a number of factors including unusually large reactions to Federal budget cuts and job loss announcements. An improvement in job security and optimism about the economic outlook are likely keys to recovery.